World champions Christina Hammer and Claressa Shields. 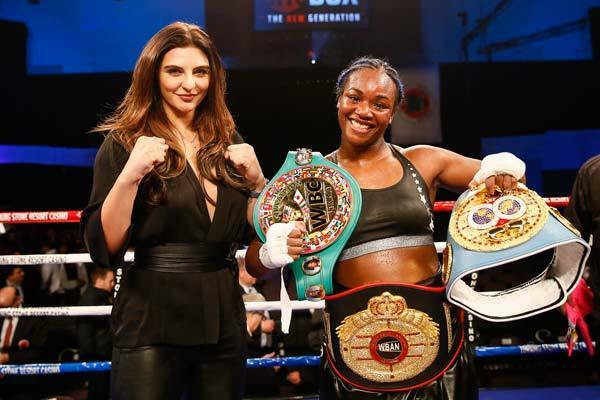 Claressa Shields 9-0 (2) believes she is the best female boxer of all-time after unifying all four of the major titles at middleweight against Christina Hammer 24-1 (11) at Boardwalk Hall in Atlantic City, New Jersey on Saturday night. The two-time Olympic gold-medallist won a wide unanimous decision of Hammer with scores of 98-92 and 98-91 twice. “I am the greatest woman of all time,” said the 24-year-old from Flint, Michigan. “I did it. She didn’t win a single round. I almost knocked her out. I swear I feel like I’m dreaming right now. Thanks to Christina Hammer and her team. They said she had a hard jab and they weren’t lying. Her jab is off the chain. Shields already has her sights set on her next bout. “Women’s boxing, we’re on fire. I cannot wait to see the next super fight. Give me Cecilia Brækhus at 154-pounds. That’s who I want next. Either her or Savannah Marshall,” Shields said. Hammer, 28, was comprehensively outclassed throughout the bout. “I didn’t fight very good or fast,” Hammer said. “That’s boxing, anything can happen. I wanted this fight. She won, respect to her. She’s a tough, strong woman and that’s all I can say. Promoter Dmitriy Salita praised both combatants and likened the fight to some of the most compelling match-ups to have even taken place in the sport. “I think tonight’s fight will go down in the history books as an epic battle with the likes of Ali-Frazier, Leonard-Hearns and De La Hoya-Trinidad,” said Salita.